At MIT we used to joke that the earth science department turned on the "weather machine" on the days when prospective students were visiting and trying to decide whether to enroll (since the weather always seemed to be perfect). But maybe the admissions department got a sign mixed up when then told EAPS what kind of weather they wanted. More seriously, this may be important for explaining labor supply responses to the weather. Abstract: Does current utility bias predictions of future utility for high stakes decisions? Here I provide ﬁeld evidence consistent with such Projection Bias in one of life’s most thought-about decisions: college enrolment. 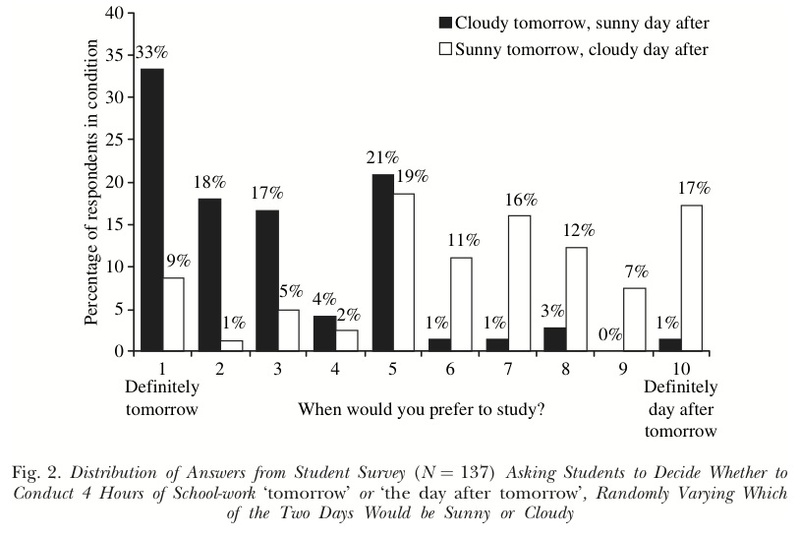 After arguing and documenting with survey evidence that cloudiness increases the appeal of academic activities, I analyse the enrolment decisions of 1,284 prospective students who visited a university known for its academic strengths and recreational weaknesses. Consistent with the notion that current weather conditions inﬂuence decisions about future academic activities, I ﬁnd that an increase in cloudcover of one standard deviation on the day of the visit is associated with an increase in the probability of enrolment of 9 percentage points.